Follow this link for more information about our Upgrade Policy. 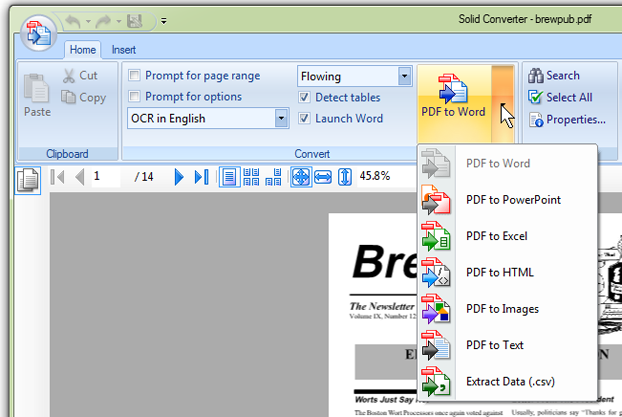 Solid Converter sets the standard for PDF to Word conversion. Almost 20 years of PDF to Word, PDF to Excel, PDF to PowerPoint, PDF to text and PDF to HTML document reconstruction expertise. Try it today and see for yourself. Purchase today. Solid Converter now has an easy to use start page to access your key tasks and files. The simplified user interface has a focus on the core functionality - document reconstruction: bringing important and commonly used options closer to the surface, simplifying the application of options: one set of options, one way to perform a task. 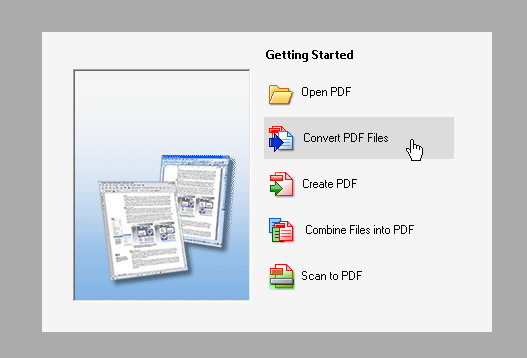 By popular demand we've integrated features such as print, search and document properties to make our product a better default PDF viewer. Microsoft Word Ribbon Add-in for Office 2007, 2010, 2013 and 2016. Quickly "open" PDFs in Word and includes excellent direct Scan to Word functionality that is obviously missing from Word. Solid Converter is a native 64 bit application when running on 64 bit Windows. This improves performance and capability when dealing with very large documents (32-bit processes limited to using only 2GB of computer memory). Solid Converter now takes advantage of multi-core processors. This improves performance for time intensive operations like OCR and batch file conversions. Windows 10 is supported. Solid Converter also runs on Windows 8.1 and Windows 7. Selective conversion is much improved and simplified. 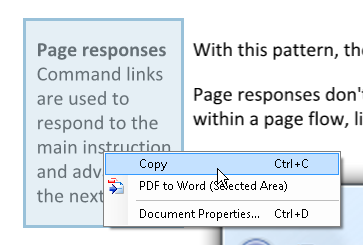 You can now reconstruct a selected area of a PDF page directly to the clipboard in multiple formats with a single click. 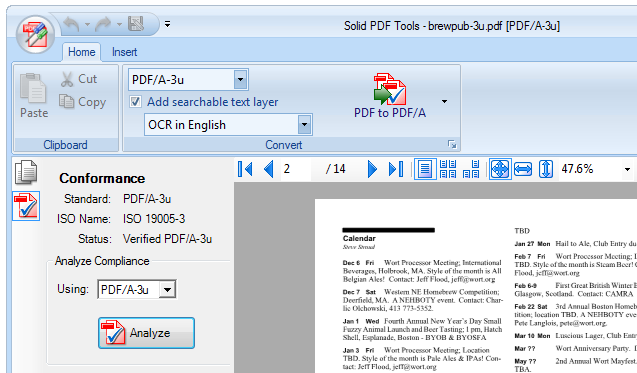 Solid PDF Tools has reworked scanning functionality for easy document assembly. Supports the two most common scenarios very well: Scan to PDF and Scan to Word. WIA and TWAIN drivers supported. Solid PDF Tools will present your scanner manufacturer's scanning dialog so you can use all the features available for your device. Solid PDF Tools and Solid PDF/A Express have superior PDF/A creation, conversion and validation tools. PDF/A-3 (support for 3a, 3b and 3u): PDF/A-3 is based on the ISO standard 32000-1 and offers support for support for embedded files of any format. Tagged document structure is required for PDF/A-2a and PDF/A-3a compliance. Existing tags are preserved when converting tagged PDF files to PDF/A-2a and PDF/A-3a.